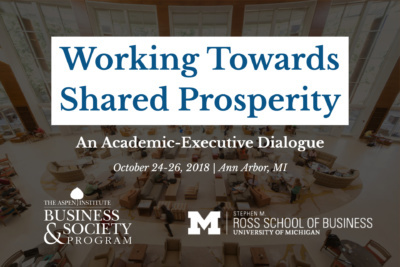 The University of Michigan’s Ross School of Business and The Aspen Institute’s Business & Society Program hosted Working Towards Shared Prosperity: An Academic-Executive Dialogue on the future of job creation, job quality and shared prosperity. Click here to view the full agenda. Mapped the “choice points” available to firms—actions that are within the purview of business managers—that contribute to shared prosperity. What management practices and new business models positively effect employees—their development, well-being and productivity—and the labor market more broadly? Explore the incentives and constraints that are influencing business decisions about hiring, compensation, training, and job quality. What conversations are happening within firms and in capital markets around these issues? What conditions allow for “better” decisions? Examine recent and on-the-horizon changes in labor, capital and product markets, including the ascendance of AI. What are the effects of all these changes on economic inequality; importantly, how do managerial choices feed back into these markets? And over time, encourage new and relevant research and teaching by management scholars. At the October dialogue we began to inventory teachable ideas, seed new research questions—and consider how academia might evolve to ensure that relevant, actionable knowledge is being created and shared—so that both current and future business leaders understand business’ role in effecting economic inequality. The event has already produced a variety of outputs. 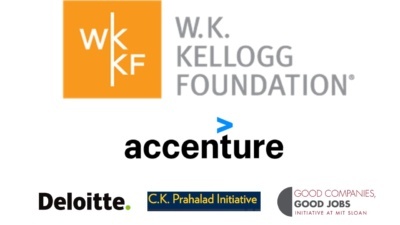 Indeed, presenting new research produced with Accenture on the future of upskilling was a high point of the event. We also produced a special edition of our Ideas Worth Teaching digest on 21st-century challenges and opportunities for shared prosperity. No less significant is the community of practice supported by the event. A highlight was the awards dinner celebrating winners of the 2017 Ideas Worth Teaching Awards—check out the photo album!